Attempting to describe butoh is often like the blind men describing the elephant: everyone grasps only part of the picture. About the only thing every butoh artist has in common is a dogged determination to find his or her own way. Another concept at the heart of Butoh is that of Being rather than expression. When a modern dancer wants to dance water, he or she might think about how water moves and develop ways of reflecting or expressing that movement in the body. A butoh artist would be more likely to create the experience of being water vividly in his or her internal imagination and then let the body be free to respond as it will to the impulses created by the image. Which brings up two key points. The first is that much butoh movement is derived from an inner image that the dancer holds during the dance. The movements then come from impulses created by the image rather than conscious choices by the dancer. For some artists, the result is a very depersonalized form of butoh. Min Tanaka says, “I do not dance in the space; I dance the space,” suggesting that the impulse for his dance is not coming from ego or self. 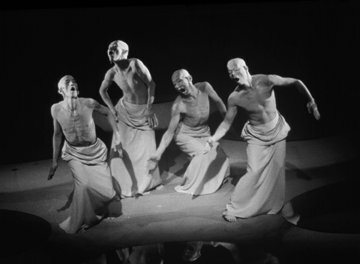 Other butoh artists, like Akira Kasai, reject what they see as an objectification of the body and strive to manifest a conscious spirit in their dance. (What that spirit is, though, is not necessarily the obvious.) Kazuo Ono in particular revealed a depth of emotion rare among butoh artists. Another element most butoh has in common is a rejection of traditonal value judgments in regards to the art. “Do not try to be good,” Kazuo Ono says. For this reason, critics especially seem dumbfounded by the art form. The values they are looking for are not ones that butoh artists strive for. There is also a clear preference among butoh artists for performing away from traditional stages. There is a fascination with the grotesque and the absurd in much of butoh, as well as a nostalgia for a pre-modern society. Butoh evokes a timeless world that existed before culture and will exist after it.